The Brewster VFW organizes the annual Memorial Day Parade & Wreath Laying Ceremony, as well as the Veterans Day Ceremony in downtown Brewster. You will see our members at the Founders Day event in the village, and will occasionally see us passing out Buddy Poppies at local supermarkets and retail shops. We actively seek to help local veterans and families of veterans in need. In the past, we have provided work parties for home projects, financial assistance for special circumstances, and a shoulder to rest on or a sympathetic ear. Each year we hold a summer picnic and a Christmas party at the Castle Point Veterans Hospital for the patients there. And we show support to veterans’ families at funeral services and burials. We sponsor scholarships and awards programs for local students, scouts and teachers, including Voice of Democracy and Patirot’s Pen scholarship contests, and Teacher of the Year and Scout of the Year awards. We sponsor a breakfast fundraiser on the second Sunday of the month. Our Post has sponsored numerous blood drives and fundraisers for other non-profit organizations and local community causes. We have a canteen/club on premises for members and their guests, and our dining hall is available to the public for rentals at a very reasonable rate. To find more info on each of the programs and community events we organize, visit our Programs/Community Service page. Elections are held each year to choose the officers of our Post. Below is the current roster. Do you have a question about an upcoming event? 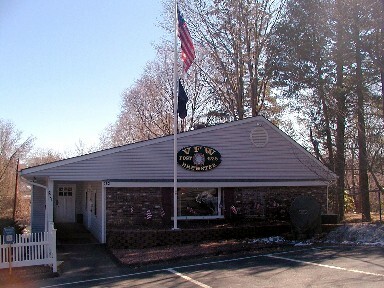 Are you interested in joining the Brewster VFW or our Auxiliary? Or are you looking for a venue to host a party? Contact us to start the conversation.